Enjoy carefree days outdoors with the Netted Swing in green. Easily attached to most swing sets and frames, the Netted Swing makes a beautiful addition to any garden. Kids can have fun swinging through the air or lying back on the wide seat to look up at the clouds. The netted seating is designed for comfort and durability, with strong PE roping that’s smooth to the touch and kind on little hands and legs. 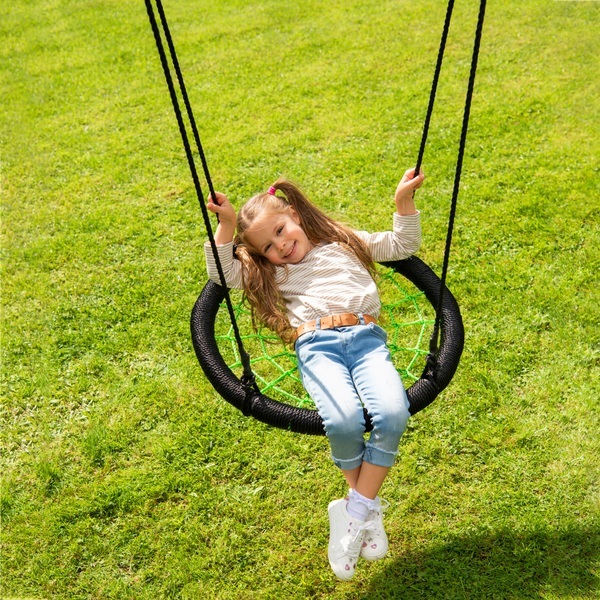 The Netted Swing is given its shape by a ring of steel tubing that is strong, durable and covered in foam for safety and comfort. The 65cm diameter is compact enough to fit most at-home playground sets, and sized just right for backyard fun. You can even adjust the swing height to suit your child as they grow. With a maximum user weight of 50kg, the Netted Swing is the perfect garden toy for years of outdoor adventures. EU Warning: Only for domestic outdoor use. Not suitable for children under the age of 3 years.